Includes Entrance for one (1) to NYC Memorial Day Weekend Party Cruise. 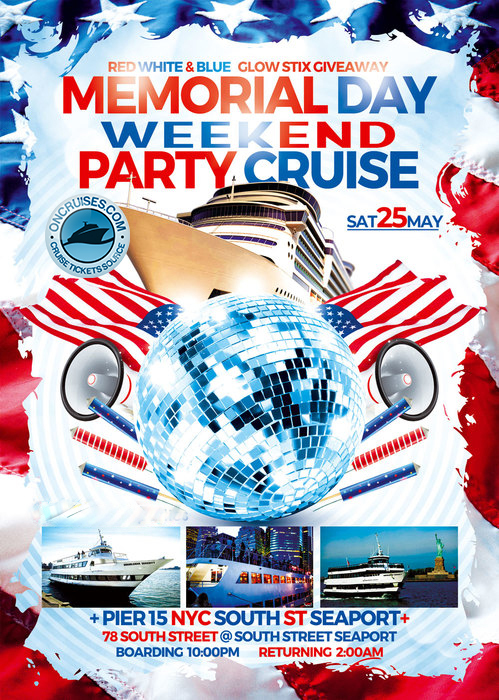 Includes Entrance for five (5) to NYC Memorial Day Weekend Party Cruise. Spend memorial day weekend Saturday night dancing on the water aboard the Hornblower Serenity Yacht New York while celebrating on the Hudson River. Setting off from Pier 15 NYC South Street Seaport, glimpse great views of the world-famous New York City skyline and Statue of Liberty while you celebrate Memorial Day Weekend in New York aboard the Hornblower Serenity NYC. Enjoy drinks and dinner buffet for purchase while the live DJs spinning a mix of Top 40, house, rock, hip-hop, Latin and mainstream music. Get your tickets for this exclusive event now, it's first come first serve and it’s a 21 and over cruise. -Live DJ spinning a mix of music on 3 levels. Get your tickets for this exclusive memorial day weekend party. It's first come first serve! This is a 21 and over cruise. The Dance Party On The Water - 3 levels to Party ! - Smoking Allowed on the Outdoor Decks. Boarding Starts at 10:00 p.m. Sailing approx at 11:00 p.m. till 2:00 a.m. Please Note The Hornblower Serenity Yacht NYC Rules and Dress code !! All guests must be 21 & over with Proper ID required. Dress to impress at Security’s Discretion. We sail RAIN or SHINE. The Hornblower Serenity boat is enclosed and climate controlled.